Have you decided to ditch that drab concrete patio in favor of something more aesthetically pleasing? Or maybe you’re just tired of stepping out your back door and directly onto dirt or grass. A modern paver patio may be the answer you’re looking for. Pavers are the ideal choice for backyard patios because they can be customized however you like and are ready to use immediately after installation. Whether your project is small or large, pavers allow you to be creative. They come in concrete, brick or stone and in a variety of shapes and colors. 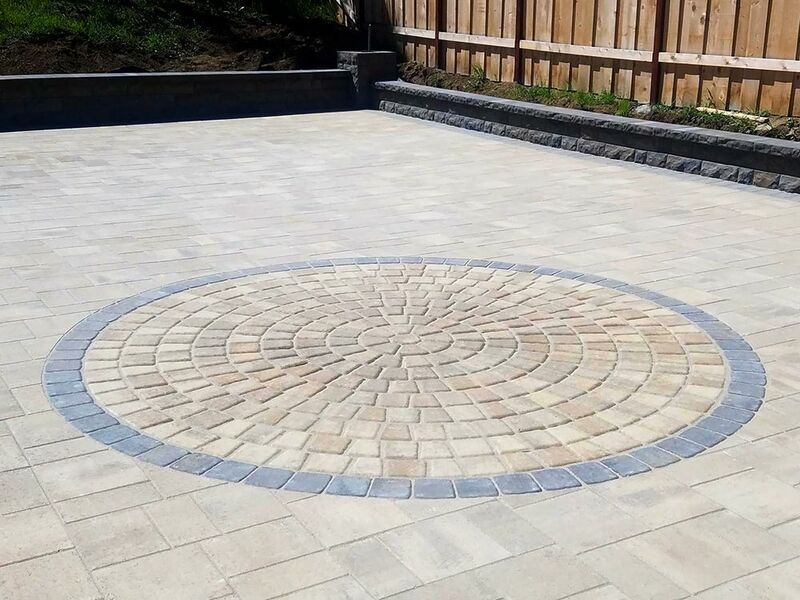 You can customize your patio further by laying the pavers in any pattern you’d like, such as basket weave, herringbone or running bond. Looking to spend more time relaxing in your backyard than maintaining it? Good news! Pavers are virtually maintenance-free! Although, a little work does go a long way. Sweep your patio to keep debris away and pressure wash regularly to enhance its appearance. Every couple years it’s a good idea to reseal your pavers to increase longevity. Convinced pavers are for you? The next step is to choose the ideal surface for your project. It’s important to choose the right materials—those that are built to last and pleasing to the eye. Budget, size of the space, color, and the style of your home will help you determine which materials to go with. It is important to consider what the patio will be used for when determining the materials you should use. 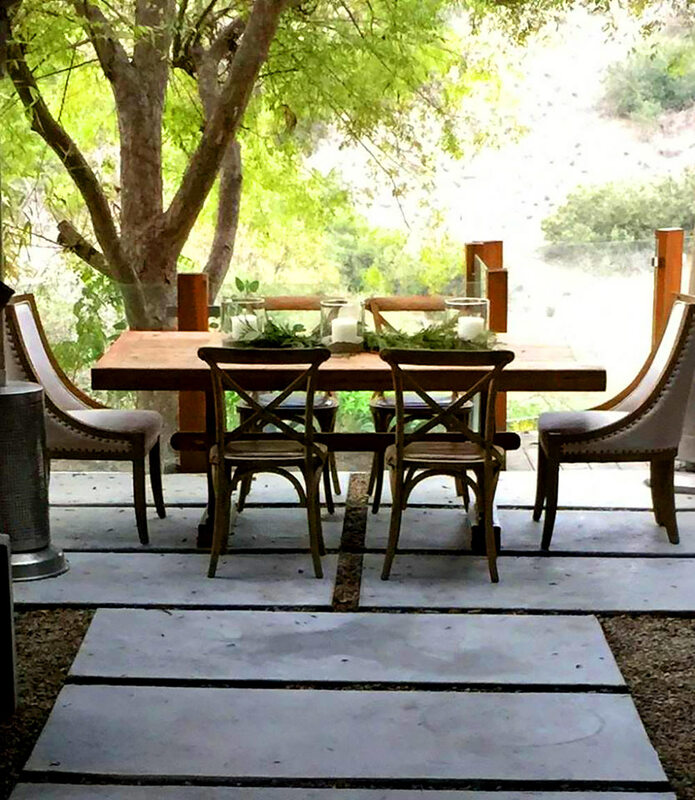 Creating a outdoor dining or outdoor living area? Is accessibility important to you? Flat, smooth and even surfaces are ideal. However, you don’t want to go too smooth. Concrete or polished granite becomes slippery when it gets wet. But rough cobblestones and bumpy aggregate concrete pavers could lead to someone tripping or may make it harder for someone in a wheelchair to get around. Brick is made from clay and comes in a wide variety of colors and textures. It is also very strong and stain resistant. If you’re looking for low-maintenance, timeless style, then a brick paver patio may be for you. 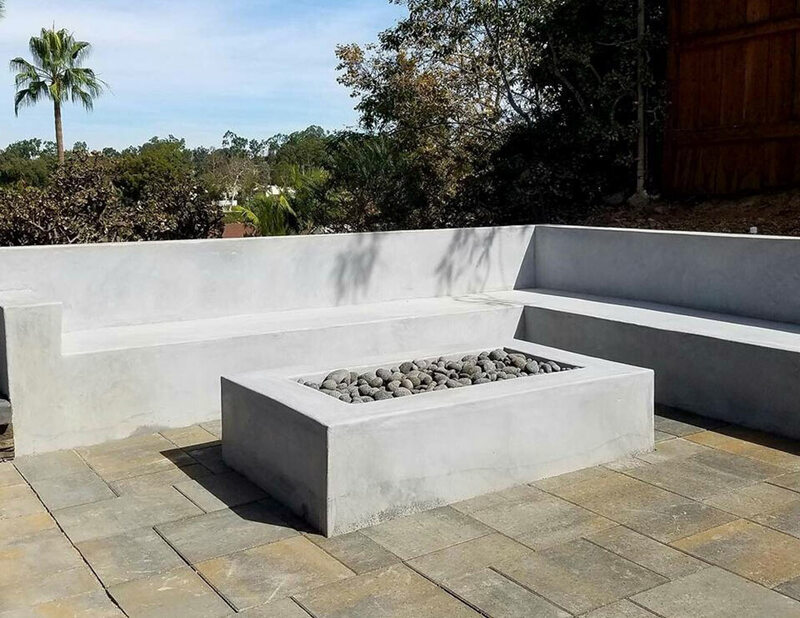 While poured concrete is boring, concrete pavers is a nice option that comes in different sizes, shapes and colors. It’s also a cost-effective option if you’d like to keep your budget in check. Concrete pavers come in a variety of textures and finishes like aggregate, rock salt, etchings, hand carving and stamping. You can find flagstone, cobblestone, veneer stone or cut stone pavers at your local stone yard or supplier. Natural stone is more expensive than bricks or concrete and is not ideal for use in high-traffic areas. But if you’re looking for a beautiful and durable patio material, stone may be for you. Stone and concrete pavers are both installed spaced apart, with loose materials like sand to fill the gaps. Still can’t decide on the perfect material for your patio project? Take a look at 8 of our modern paver patio ideas to get inspired! 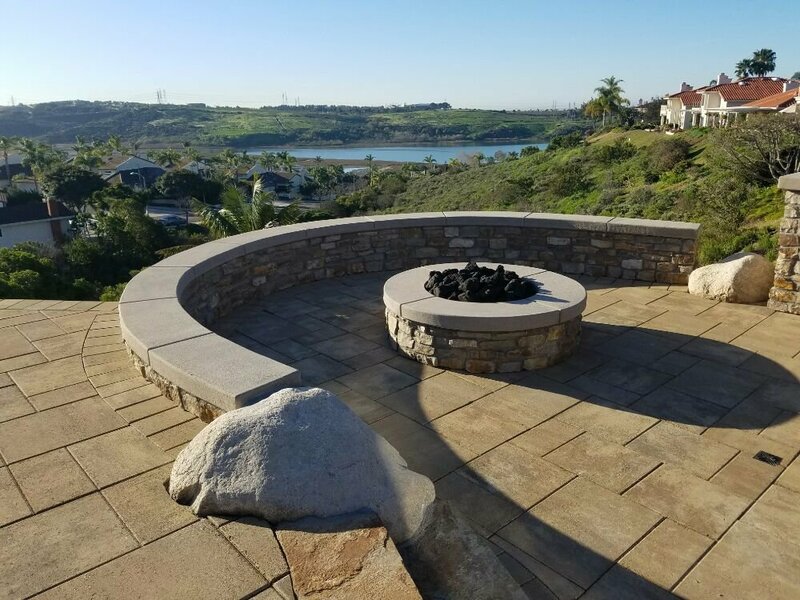 Nestled into the hillside of Southern California you will find this beautiful patio made of Belgard pavers set in a box pattern. Soak up the sun and take in the ocean views by day and roast marshmallows by the fire pit at night. 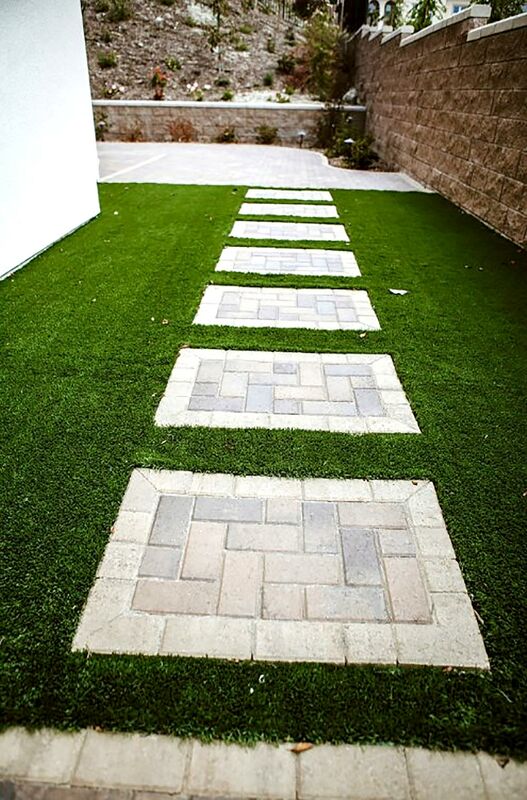 Ditch the traditional solid path to your backyard retreat in favor of paver steps laid in a herringbone pattern and set in low maintenance artificial turf. Turf is an eco-friendly option that will save you money on your water bill. If you’re looking for simple, yet timeless, this full-color flagstone patio set in a bond pattern is the way to go. Top it off with an outdoor kitchen and you’re on your way to becoming an entertaining pro. Our customers loved their paver patio created with a Paver Circle Kit with Belgard Catalina Pavers in the Montecito color. Catalina’s modular design and natural slate textured finish makes it a great choice for your modern paver patio project. 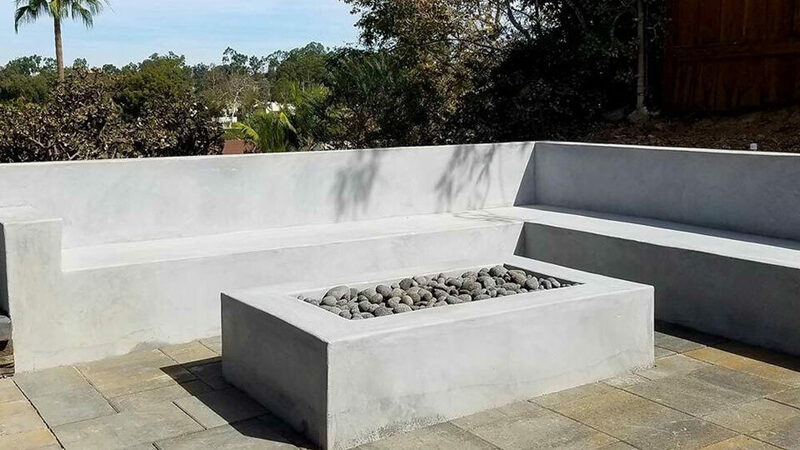 This stunning project makes us want to sit around the fire with our barbecue while looking out at the view! 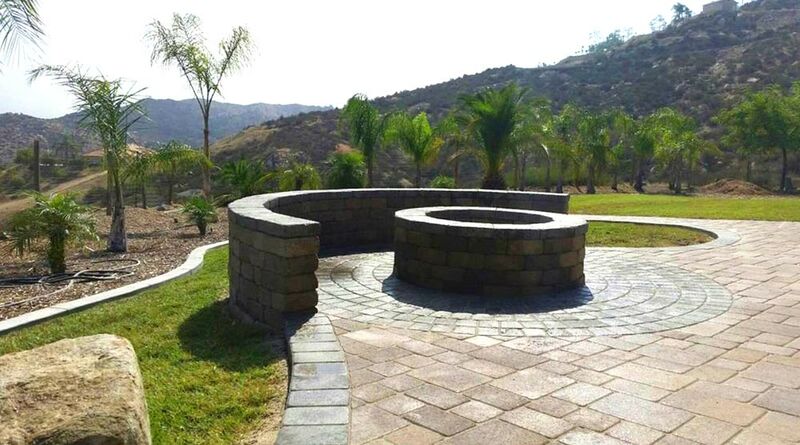 Cobble pavers surround the outdoor grill and fire pit, and also serve a dual purpose as a retaining wall and seating. We love this ultra-modern concrete space, perfect for late night gatherings. The pebbles between each paver are permeable and add to the overall design. 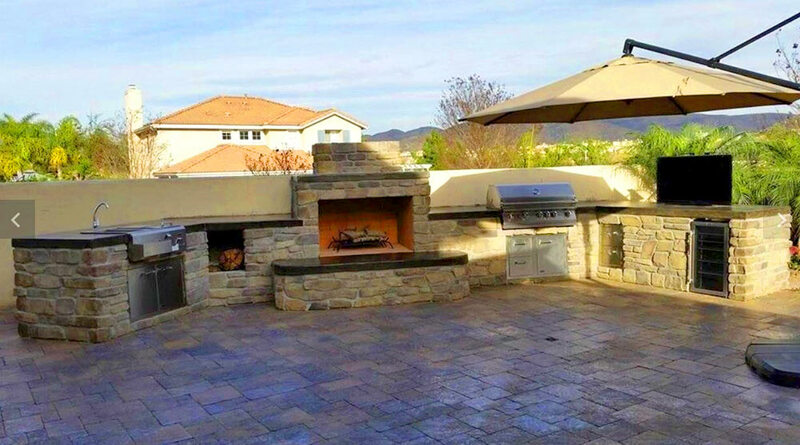 Catalina stone pavers welcome you into this San Diego backyard, which features a versatile outdoor kitchen and fire pit. 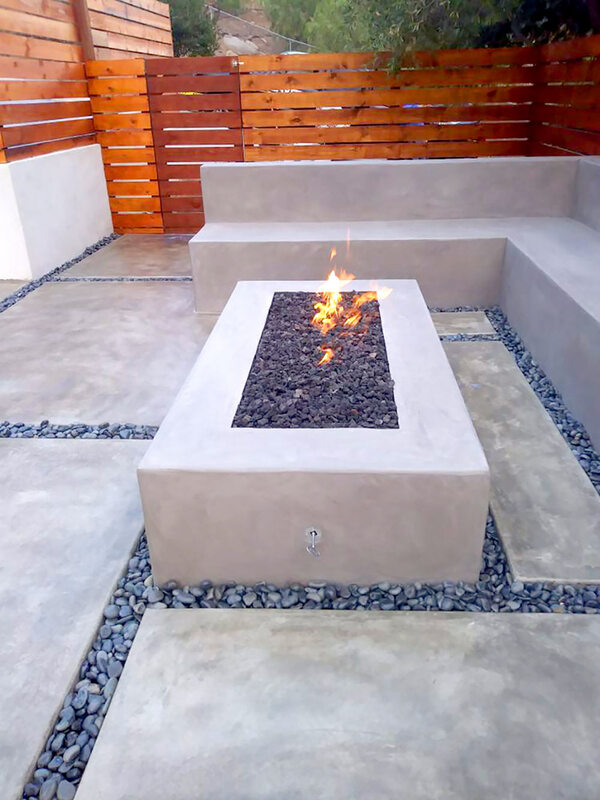 Concrete is the perfect material for a modern paver patio. 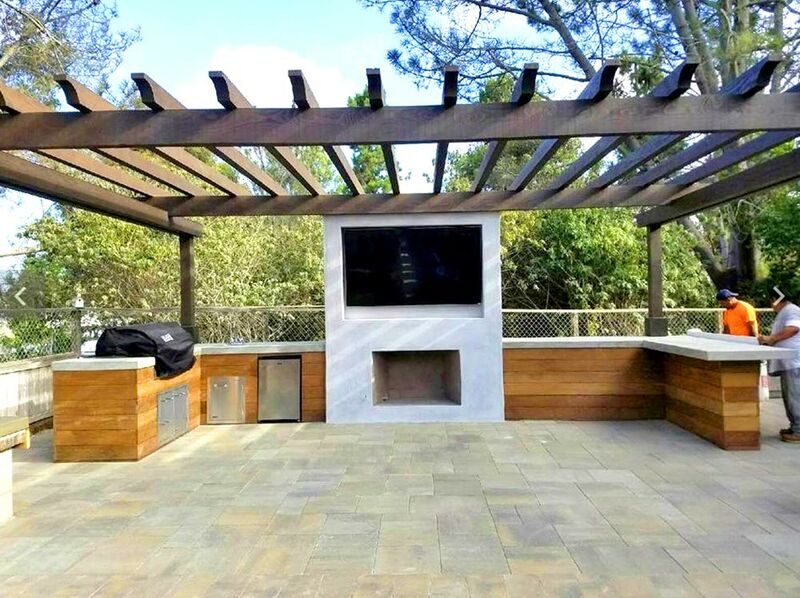 This stunning outdoor living space set under beautiful trees in Laguna Beach is the epitome of modern tranquility and the perfect space for outdoor entertaining.